The findings have implications for the study of cancers, autoimmune diseases, and parasitic infections. Researchers at the European Bioinformatics Institute (EMBL-EBI) and the Wellcome Trust Sanger Institute have discovered that some immune cells turn themselves off by producing a steroid. The findings have implications for the study of cancers, autoimmune diseases, and parasitic infections. If you've ever used a steroid, for example cortisone cream on eczema, you'll have seen first-hand how efficient steroids are at suppressing the immune response. Normally, when your body senses that immune cells have finished their job, it produces steroids –but which cells actually do that? 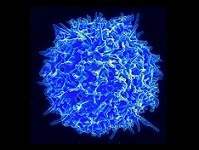 "We were really surprised to see that these immune cells are producing a steroid. In cell culture, we see that the steroids play a part in regulating T cell proliferation," says Bidesh Mahata in the Teichmann group at EMBL-EBI and Sanger, who designed the study. "We had already seen that T-helper cells were producing steroids, but initially we were blind – what was going on?" Illustration: National Institutes of Health.